My entry into the Department of Botany was tenuous at best, but that just goes to show my determination to make it work. I was invited to join the department in 1963 for a one-year tentative faculty position as Assistant Professor to develop the area of Plant Ecology in the Department of Botany. UH had requested the faculty from the Hawaiʻi State Legislature, and while approval was expected, it had not yet been given. Despite the long-term uncertainty, I responded with excitement. I left my position as a forest research officer in the Canadian Department of Forestry in Winnipeg, Manitoba, and arrived in Honolulu in September 1963 with my wife and five small children. The department was relatively small at the time, and most of the 10 faculty members came together to welcome us at the Honolulu Airport. I spent my first six semesters teaching Introductory Botany (Bot. 101 & 102), taking over from Dr. Charles H. Lamoureux who had been elected as Chairperson of the Department. During that time, I also developed two Botany 400 courses, one in Plant-Autecology and one in Plant-Synecology. Between 1963 and 1966, Botany developed a close relationship with the National Park System in Hawaiʻi. Garrett A. Smathers, one of the Park Naturalists met with Max Doty and asked for research help from our Botany department. At that time, Park Naturalists often found themselves in positions explaining park features such as volcanic disturbance effects, plant taxonomical questions, community and vegetation features, by the “seat of their pants,” without proper scientific knowledge. Our Botany Department could help explain such park features through appropriate research. The Park gave Botany $5000 to initiate the Atlas of Bioecology Studies. Several faculty members contributed to the Atlas, including F. Raymond Fosberg, Charlie Lamoureux, George Gillett, and Gladys Baker. This project generated a lasting relationship of our UHM Botany Department with Hawaii Volcanoes National Park (HAVO) that continues to this day. In 1967 I left the US for two years so I could apply for a permanent Immigration Visa. After spending two years in Germany and Sri Lanka, during which I kept in close contact with the department, my position was made permanent and I was promoted to Associate Professor of Botany. My family and I received our immigration visas and moved back to Honolulu that year. Soon after my return, I was asked to develop a research proposal for a new UNESCO-propagated program of international ecosystem research, called the International Biological Program (IBP). I based our proposal on several hypotheses from the Atlas. We received $1.5 million for the initial two years and started the program in 1970 in Hawaiʻi Volcanoes National Park. In 1976 we wound down our field research and began writing our IBP synthesis volume, entitled ISLAND ECOSYSTEMS, Biological Organization in Selected Hawaiian Communities. It was published in 1981. Out of the IBP research came several new research projects. One was to study segments of the Hawaiian Metrosideros rain forest which were rapidly dying across the east slopes of Mauna Kea and Mauna Loa. The canopy dieback history is discussed with many color photos in the 2013 book "Ohi’a Lehua Rainforest: Born Among Hawaiian Volcanoes, Evolved in Isolation--The Story of a Dynamic Ecosystem with Reference to Forests Worldwide". The other major focus evolved as a new research project of the vegetation throughout the Pacific Island Region. My first Botany Professor, Dr. Heinrich Walter at Stuttgart-Hohenheim, Germany, initiated a series of world-regional vegetation monographs. He asked me to develop one for the tropical Pacific Islands. 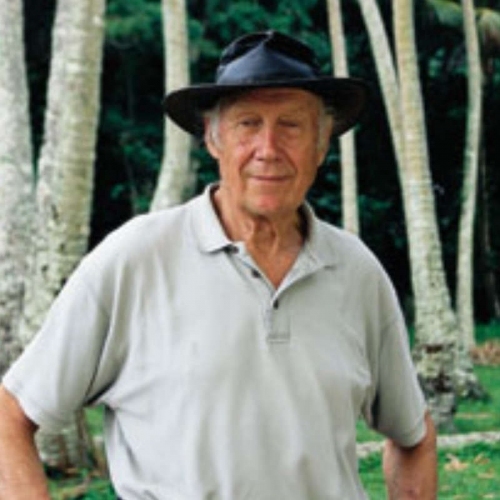 Dr. F. Raymond Fosberg had much research experience in Polynesia and Micronesia and joined the team. I was tasked with Melanesia, thus spending my 1981/82 sabbatical year with my wife, Annette, in Fiji, New Caledonia, New Guinea in New Britain, Bougainville in the Solomon Islands, Vanuatu in New Zealand, and then again back in Fiji. Out of this work came a book Vegetation of the Tropical Pacific Islands by D. Mueller-Dombois and F. Raymond Fosberg. Sadly, Ray Fosberg had passed away in 1993 before he could see the book completed. The last chapter of the book, “The Future of Island Vegetation,” led to another project, the PABITRA (Pacific-Asia Biodiversity Transect) Network. The Network was initiated at the Pacific Science Inter-Congress in Fiji in 1997, with the help of one of my former graduate students Kanehiro Kitayama. Though I retired in 1990 and became an Emeritus Professor of Botany, I continued working with the Network, which was run from 1997-2007. We held field workshops with indigenous island participants (mostly students, but also teachers, island foresters and land managers) in Fiji, Samoa, Hawaii, and Palau. In 2008 we published a PABITRA Manual for Interactive Ecology and Management entitled Biodiversity Assessment of Tropical Island Ecosystems, which includes a chapter on ethnobiodiversity. Since my retirement, the department has continued to do the great work I am privileged to have been part of. I believe the most important contribution the Department of Botany has made is in the world-class education it provides to students who want to help protect and manage the unique tropical island biota and its ecosystems of Hawaiʻi. While no longer as active as I used to be, I still have a small office on the 6th Floor in our St. Johns Plant Science Building, where I come whenever I need to reference a sources from bookshelves or the library. Currently I’m working with colleagues on a book titled Watersheds and Ahupua’a: Resilient Ecosystems in the Hawaiian Islands. I also attend occasional seminars and talk with former colleagues about current questions in the field and enjoy staying connected with the department as much as I can. I benefitted tremendously from being a faculty member in the Department of Botany. I have dedicated my house and property in Volcano village on the Big Island as a gift to the UHM Botany Department as an expression of what value the UHM Botany Department has meant to me. I hope it helps the department continue to educate and train future generations of scientists who will contribute to Hawaiʻi’s understanding and care for the native flora that make this chain of islands so unique. Mahalo nui loa.